Thank guys. And yes Thomas that will be the next project. We see how that goes. looks great! and it's finished! I see some curved thingamabob framed there on the roof of your building. Got something ambitious planned there too? 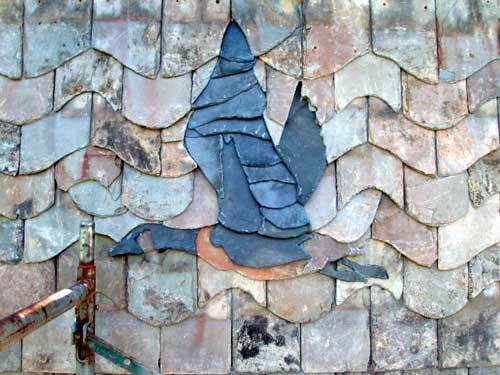 I would like to thank Martin for comeing to the 2007 SRCA conference and his demo on slate art. He used a hammer as a slaters stake to do all of his work. That inspired my self to hand craft my own slater stake. And would not have been able to make this pc of the goose with out it. You can always learn new/but old tricks. On the second goose, I broke only two pcs after changeing to the stake. Here is my second goose flying away. Here is my sloppy Germany-American style. 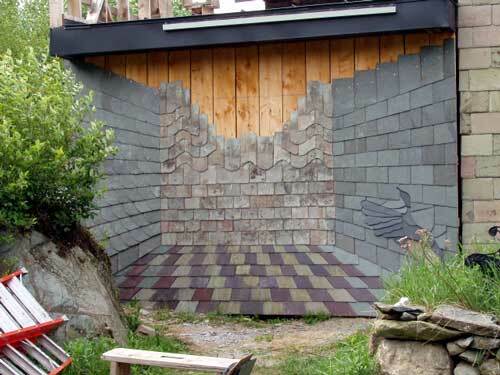 Be careful with the slate walk up to the mural... It looks convincing enough that people might walk into it and you could be left with a silhouette of a person instead of a duck! Yes, I am useing a vanishing point or its really a vanishing line. When the second half is done it will really come out. I was inspired by the pictures in Joe's book, two links from the resource guide in the book, and a Fine Homebuilding back cover. 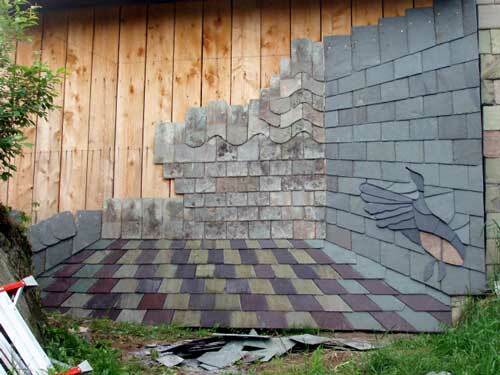 I am also think of doing a slate walk up to it, out of the same colors? Well we will see! Wow. It looks so 3D - was that intentional? Well what do you think??? Should I Stop? Let see there this takes up!! This is not amateur hour. 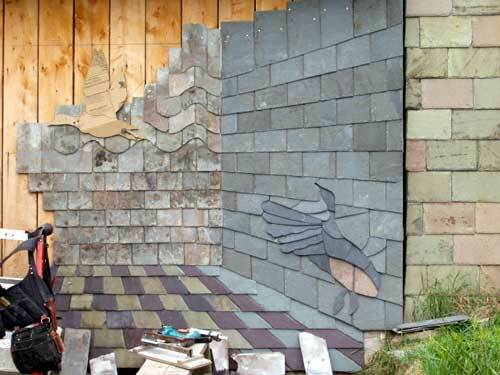 Liam (Slate Affiar, Inc.) will be doing a slate siding workshop at the SRCA conference, June 8-10, 2007 (http://www.slateroofers.org/conference_2007.html). Hello Thomas, there isn't alot to say. Its really just like doing it on the roof, but your head lap can be less. 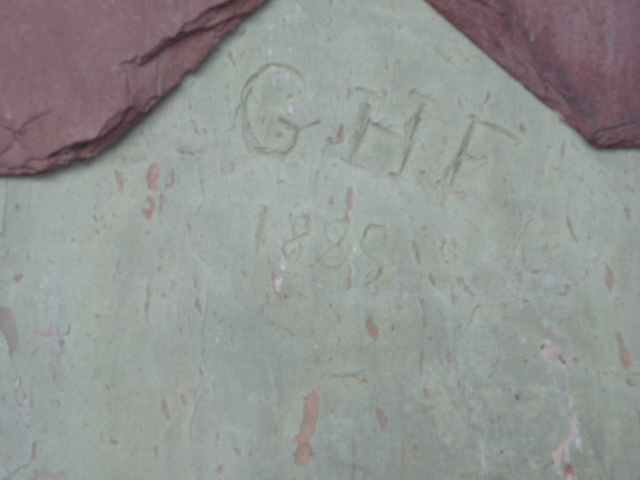 It gives you a better look at the characteristic of the slate. Also you will have no painting to do after. On all the sideing I have done I use used slate so the colors are going to stay what they are for the most part. For most of the projects I did flash in the inside and outside corners. 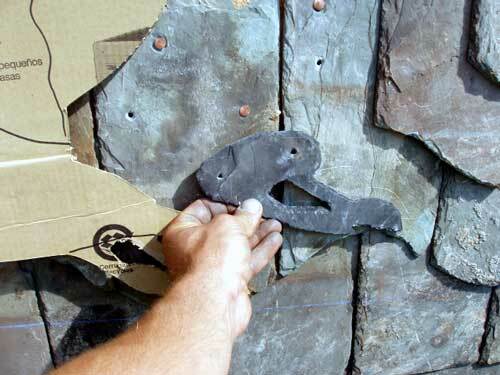 I use lead because it soft and forms to the slate and wall better. 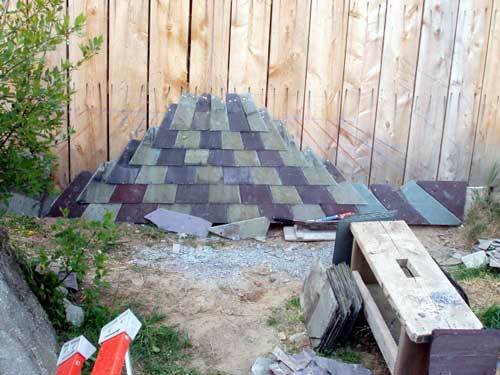 Keeping your slate flatter. I just buy rolls of lead from the local hardware store and cut it to size. I have never done any sideing with battens. 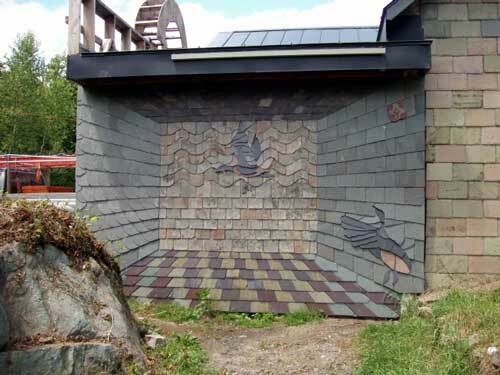 The house with the black slate has a mix of plywood and 1" boards. The other was a older house, so it was all board. In your case I would do one of two things. 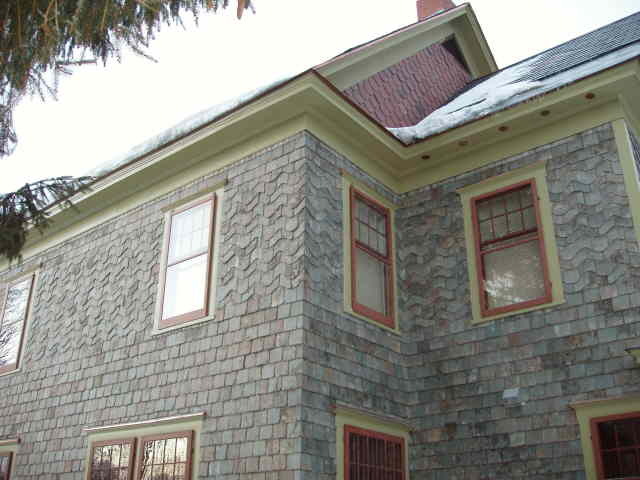 One install a layer of boards or two use copper ringshank nails, with a sealant to install to the sides of your dormers. On one part of the my house and garage (the garage has green on it, see picture) the one with the black slate, there is apart that is only 1/2" plywood. I have had no problem yet, but it was a little bouncy. 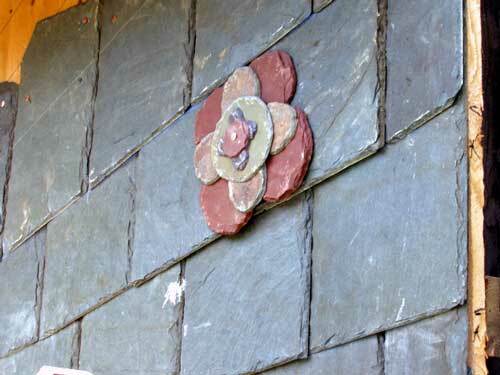 This is reclaimed slate from a building on Long Island NY, bought from Steve Taren @ Taren Bros Slate Company Vermont. 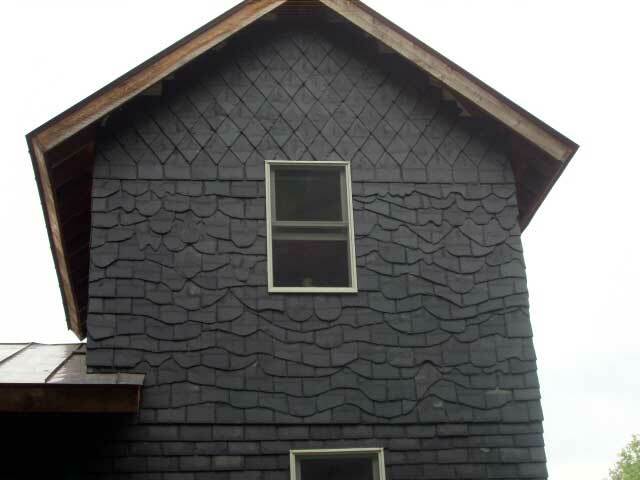 This slate siding looks awesome. These pictures are eye opening really - for someone like myself who hasn't seen siding like this. 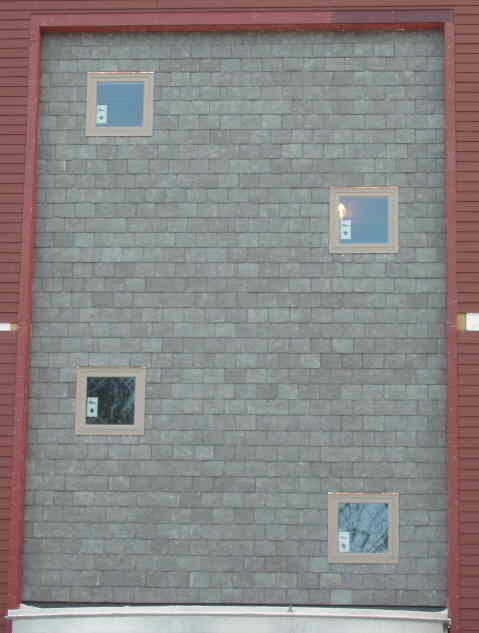 (Joe has a tempting picture of siding in his slate book too.) 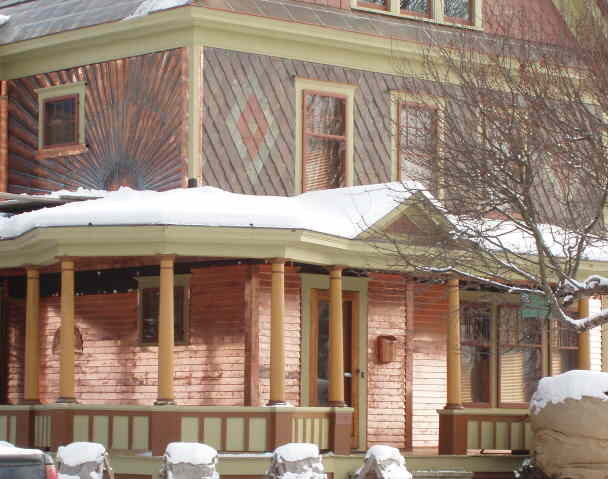 I went to the Slate Affair web site, and the copper work you have done is very nice too. The treehouse is over-the-top. I made all the copper detail on a shear and 8 foot brake in Slate Affair Inc. shop. Useing the wood trim as some what of a pattern. If you have every seen the way vinyl is installed, it is about the same. Some soldering on the top of the windows and I use silicone under the copper in areas as extra protection for water travel. You can see the sun burst has parts that drain in to the windows and needed extra work to make it water resistant. 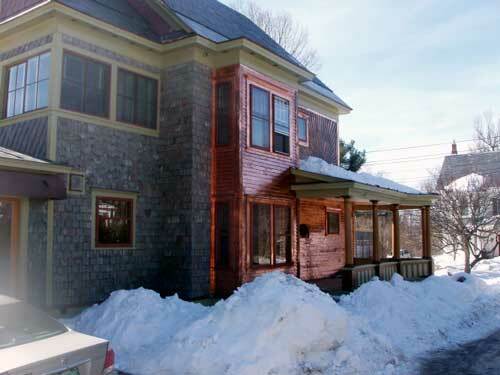 Did you make that copper siding, or buy it pre-fabricated? 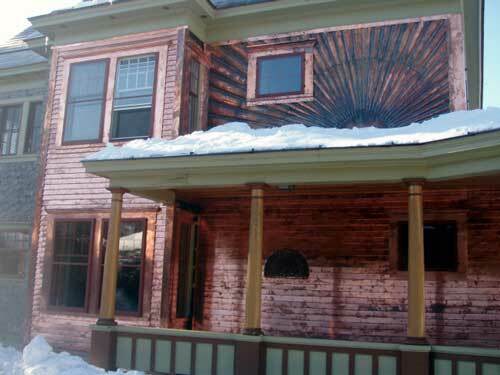 Just wait till the rich copper patina develops, which is going to last with the lifetime longevity of the slate siding. What nice detail slate makes. Its great to know you will not have to paint it like the clap boards that were on the house before. 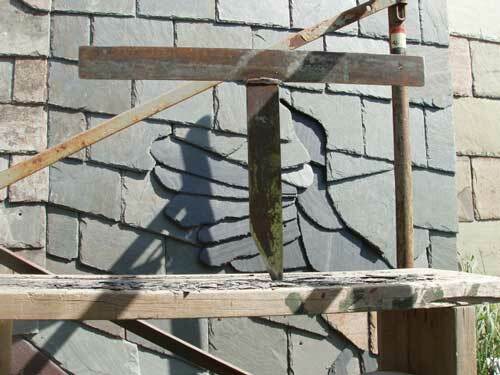 More great slate siding, all hand cut. Need help with that design or help with the layout on a job. Look no farther! Slate Affair Inc. can provide you with all that and more. A affair with slate is a life long commitment. 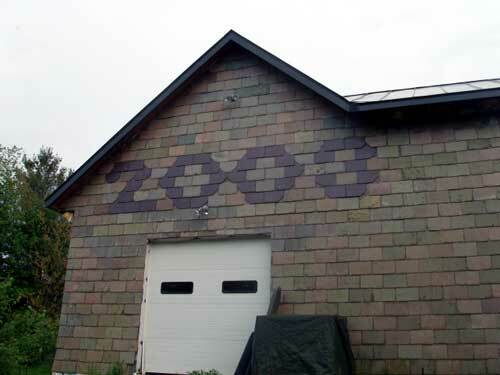 Here is a pcs of slate a person engraved and I installed it on a slate sided house next to the front door. Its old but still perfect. Slate is a long lasting and great looking product for all. Please send a CD to Joseph Jenkins, Inc. at 143 Forest Lane, Grove City, PA 16127. High resolution photos are best. I would prefer all of them so I can select what I need. The basic info I need is how you did the installation. Battens? Solid boards underneath? 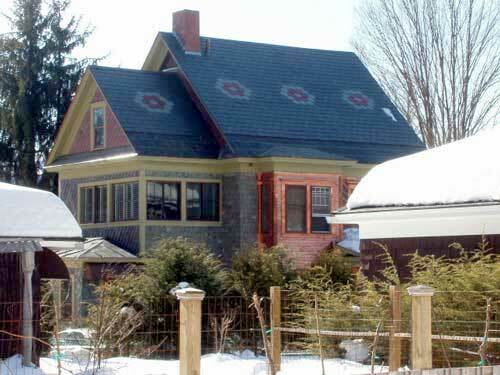 Plywood siding? Air spaces? Etc., Plus info about your business. I can get that over the phone, although a sketch of the substrate might be helpful (e.g. batten system). Can't beat local work. More slate siding to come. I would like that alot Joe. I can mail you about 100 picture on a cd or I can e-mail you what I like the best. There are two house I have done and one shop. They will not be 100% done. One will be by the end of Feb. We will have to set up a phone call for what ever info you what. 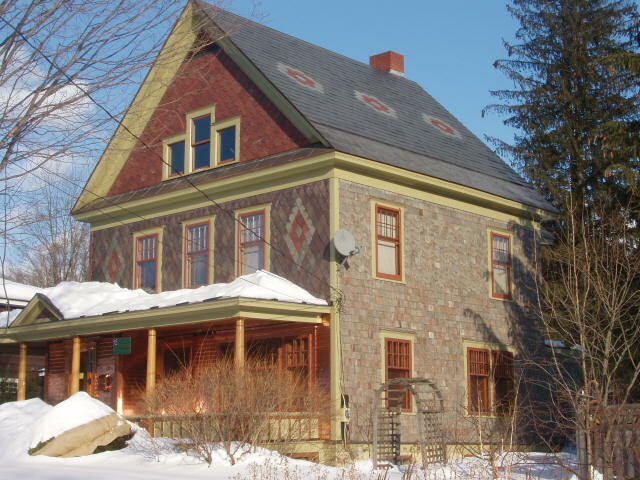 Both the houses and the shop are in Vermont. 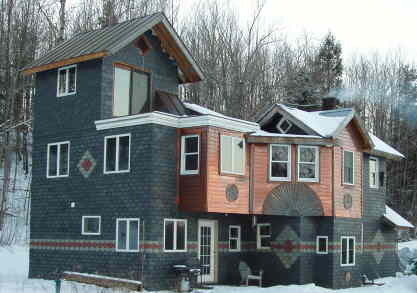 Monson Maine slate,with green and red Vermont slate. Reclaimed from a job in Hudson Mass and the remainder from the Taran Bros Slate Co. 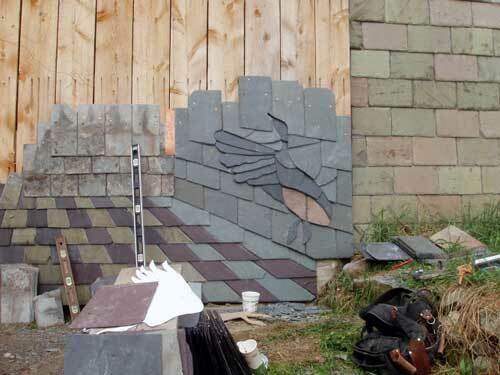 Slate siding layout and design from the roof to to the walls. Copper clading also available.